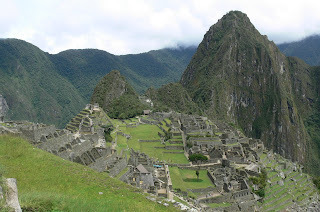 PCBG Peru: February 1st and 2nd- Aguas Calientes and Machu Picchu! 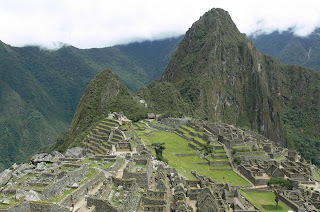 February 1st and 2nd- Aguas Calientes and Machu Picchu! This the postcard shot! 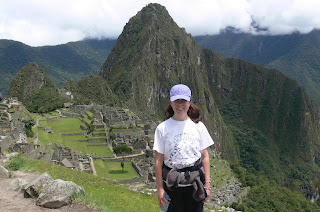 Wayna Picchu in the background and Machu Picchu, foreground! Ben and I cheese it up, for our scrapbook shot which MP in the background. This is how we cut the grass, cut the grass, cut the grass... 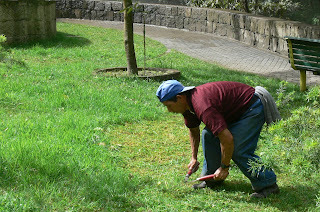 This is how we cut the gras in Aguas Calientes! Everyone sing! What can say about the pictures about? 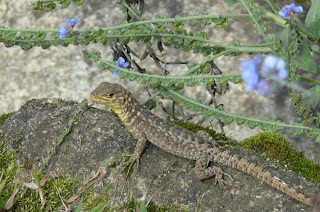 They are all shots Ben took while at Machu Picchu, agricultural terraces, bromeliads, and beautiful ruins! Today started bright and early once again... we were off to the train station at 6:30am to catch the train from Cusco to Aguas Calientes. 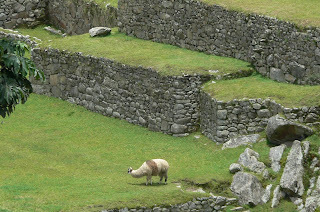 Aguas Calientes is about 2 to 3 hours from Cusco. 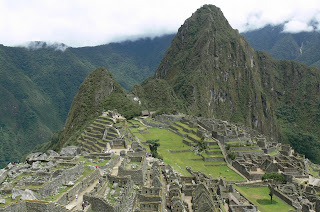 It is the portal into the Amazon basin and the only way to get to Machu Picchu if you choose to be lazy, and skip the trek of the Gringo/Inca Trail and take the train in! 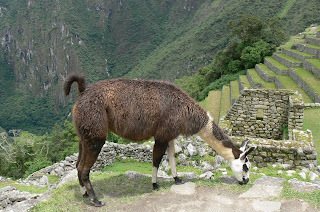 I had read in Lonely Planet that Aguas Calientes was a dirty, and not very pleasant little town and that we shouldn't look forward to our time in it, treating it merely as a stopping post to pass into Machu Picchu. However, I was pleasantly surprised. 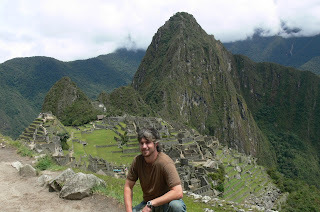 While the town is VERY touristy and "choch-kees" can be found everywhere, and I do mean everywhere, the town is interesting, because it has a mighty and fierce looking river called the Urubamba that passes right through it. 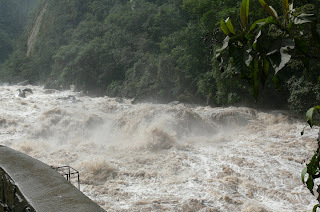 This river is amazing in its ferocity, the tumbling water was really something to see. 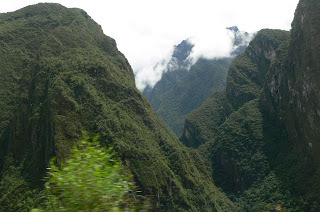 The Urubamba is one of the many tributaries of the Amazon river. The train ride was fairly uneventful, except that we make many strange starts and stops at the beginning of the ride because the train was old school and the track had to be manually switched! 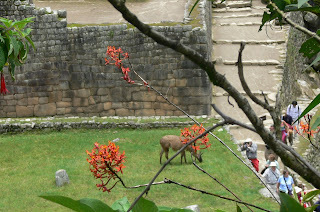 Upon arrival in Aguas we were herded (and this really is the best way to describe it!) 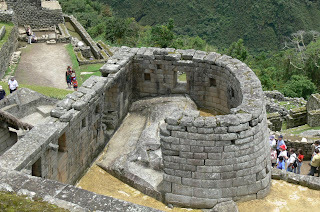 to buses that would take us up, up, up a switchback dirt road to Machu Picchu. I can't really describe the beauty of the cliffs. 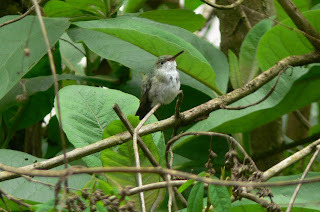 They were cloaked in bromeliads, Spanish moss, and succulents. It was gorgeous! 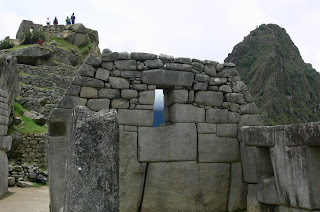 When we reached the top, our destination of Macchu Picchu, I was surprised that it seemed smaller than Ollantaytambo, which we had seen the day before! 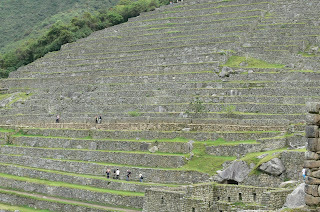 Don't get me wrong the ruins of the city are spectacular, but truthfully I was much more excited to see Sacashuaman and Ollantaytambo, maybe because I knew less about them so there landscapes were more striking to me... Anyways, we had an informative if not entirely truthful tour of the ruins. 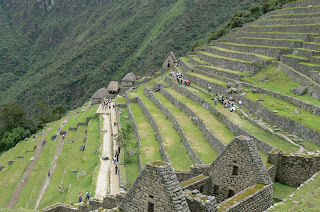 Our guide was insistent that the residents of Machu Picchu grew none of their own food on the vast agricultural terraces on the site. 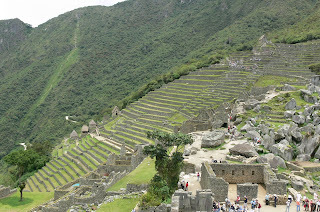 Instead, he told us that residents had made Machu Picchu into a garden city, growing only aesthetically pleasing plants on the terraces, and while in theory I think this is nice, Ben and I both felt the need to protest this theory. 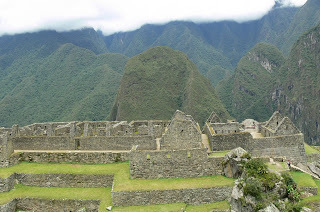 The Inca's seem to have been an ingenious, and practical people, mindful of military strategy and tuned into the importance of national security! To say that they fully relied on outside sources for their sustenance and that they chose to grow flowers instead of the food that would help insure their community security does an injustice to their memory, in my opinion! 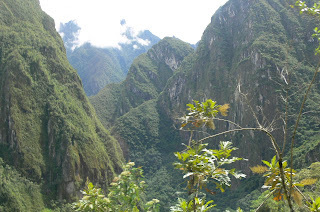 Today was our "free" day in Aguas Calientes. 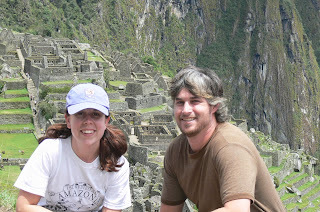 While we had the option of buying a ticket for a 2nd day at Machu Picchu Ben and I decided to be tourists and wander around the town market. We had to catch the late afternoon train back to Cusco at 3pm and I think both of us are looking forward to our free day in Cusco tomorrow, Sacsahuaman and the Cathedral in morning and early afternoon- Super Bowl (somewhere!) tomorrow night!